"Who wouldn’t love to catch a glimpse of a favorite sleuth as a blundering amateur? 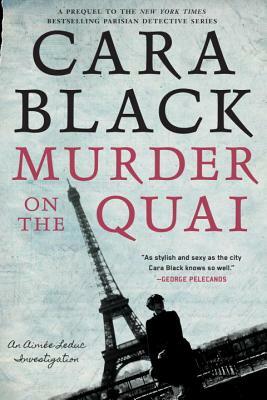 Cara Black lets us do just that in Murder on the Quai, which reveals how Aimée Leduc, her fashionable Parisian private investigator, joined the business founded by her father and grandfather . . . The case is engrossing, complete with Vichy flashbacks, but the most fun are the scenes where Aimée meets her future partners and acquires Miles Davis, her beloved bichon frisé. One caveat: For such a clotheshorse, Aimée doesn’t do nearly enough shopping." "The much-anticipated origin story of how legendary—and legendarily chic—French private investigator Aimée Leduc became the super sleuth she is today." "Fans of Aimée Leduc, the most chic private eye in France—and therefore the world—have already enjoyed 15 of her investigations as imagined by her American creator. Now we go back to Paris, 1989, for a backstory that fills in the details of how she acquired Miles Davis, her bichon frise; René, her supergeek sidekick; and her first Chanel jacket. Charmant." “Quintessential summer reading . . . The Berlin wall is crumbling, and in a series prequel Parisian medical student Aimée Leduc finds her métier, detecting." "Paris-based investigator (and fashion plate) Aimee Leduc returns in her 16th atmospheric adventure, this one with a twist. Readers flash back in time to learn how former medical student Aimee became a sleuth in the first place." "Origin stories are almost without exception powerful, and so is this one. It is perhaps one of Black's best and most memorable efforts." "Cara Black has done her fans a service with an excellent prequel . . . The 1989 setting is used to great effect–Black portrays a moment in French history stunned by the end of the Cold War and torn between past crimes, and historical legacies and future dreams." "The Aimée Leduc backstory we’ve been waiting for." "Murder on the Quai is suspenseful, emotional and, thanks to its Paris setting, très atmosphérique." "Finally we have the prequel we’ve been craving . . . A treat for series fans." "So begins the arc of Aimée's story: the first corpse, the first clue, the first shattered love affair, the first meeting with René, her eventual partner, and the reader's first glimpse of Leduc Detectives." "By filling in the character's early years, Cara Black has strengthened the bond between her creation and the many readers who have followed Aimée's development."